Happy Days Cycles and Cafe are raising money once again this February for Happy Days Homeless Charity. Last year the ride was a real eye opener, with riders spending a lot of time riding and outside, but in the middle of winter, and in town centres with all that’s going on, the noise, the animals (think rats! ), and the weather made it an intense experience. All those taking part slept well the weekend it finished!. Despite having warm showers and meals each night it was still a huge struggle coping with everything going on. To be in that situation and not be able to get out of it, not have the support, the warm meals, the fresh dry kit is quite unthinkable. The group will set off from Halifax and cover the length and breadth of the North of England, stopping at York, South Shields, Carlisle and Morecambe before arriving back in Sowerby Bridge on Friday, February 8 for a sleep out at Sowerby Bridge Cricket Club. 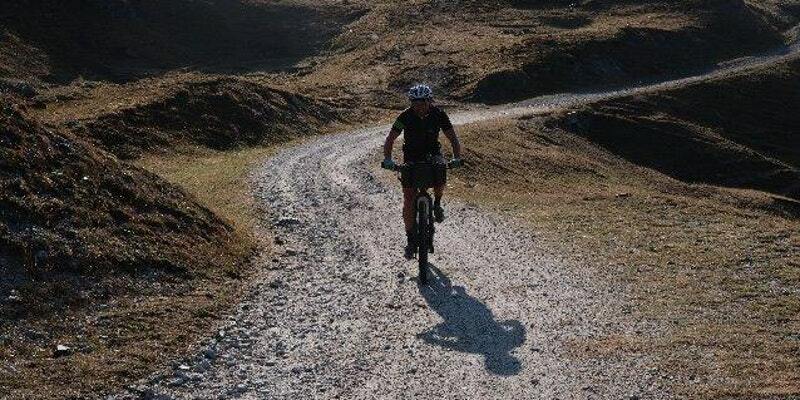 Cycling up to 80 miles a day, the team will be sleeping rough at every location, replicating the plight of the homelessness in the North of England in a bid to raise awareness and funding. Last year’s ride from London to Halifax saw more than £10,000 pounds raised for good causes in the area. 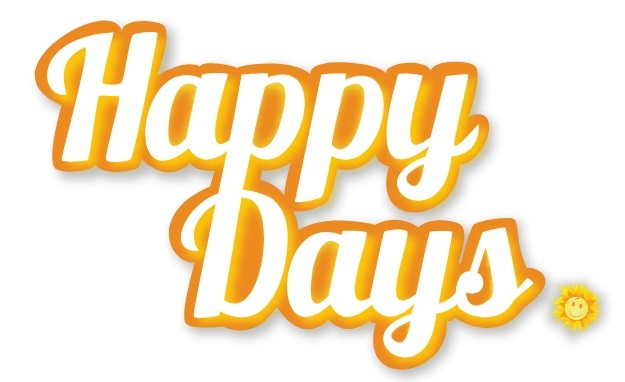 Happy Days Ministries is based in Sowerby Bridge and provides essential services to those suffering from homelessness and addiction in the area. As well as these services, its social enterprises include a cycling shop, a cafe and a building company. Happy Days also operates one of the 60 Yorkshire Bank Bike Libraries throughout the county, a scheme launched by Welcome to Yorkshire as a legacy of the Tour de France and Tour de Yorkshire designed to give every child in Yorkshire an opportunity to borrow and ride a bike for free. Dave Fawcett, CEO of Happy Days, said: “Last year we managed to raise over £10,000 and we want to go even bigger and better this year. If you’re a keen cyclist and want to get involved, we always have space available and we’d love to hear from you. Hopefully doing this ride will once again resonate with people and we can raise some much needed funds to help people off the streets”. The rough ride starts on Monday 4 February but spaces are limited so for more information email Angela@happydaysuk.org for any details. This entry was posted in Events, Feb, Sowerby Bridge and tagged Happy Days Cycles, Happy Days Homeless Charity. 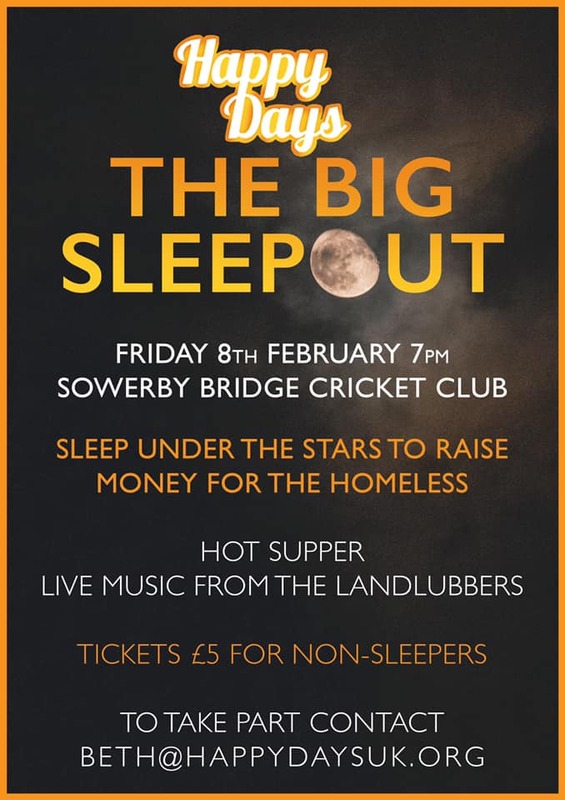 Join Happy Days Cycles and Cafe for their Big Sleep Out at Sowerby Bridge Cricket Club from Friday 8 February, 7:00pm. Sleep under the stars to raise money for the homeless. There will be a hot supper for the sleepers and music from the Landlubbers. Tickets for the non-sleepers are just £5. To take part contact beth@happydaysuk.org. Catch up on the event on the Facebook page. This entry was posted in Events, Feb, Get Involved / Have Your Say, Sowerby Bridge and tagged Happy Days Cycles, Happy Days Homeless Charity. There are no feed zones, no sign posts, you are on your own. There is a GPS track for all riders which will be sent out before the start. Free tea/instant coffee at start and finish, plus a free pasta dish at the finish. Suggested donation is £10 and you can register with Eventbrite. This entry was posted in Events, Get Involved / Have Your Say, July, Sowerby Bridge and tagged Happy Days Cycles, Happy Days Homeless Charity.